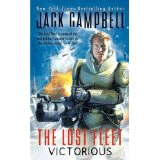 This is the sixth and last book in the Lost Fleet series by Jack Campbell. As I've said on previous reviews of this series, I don't generally like military sci-fi, but this series grabbed hold of me and wouldn't let go. I was intrigued from the very first book and none of the books in the series let me down even a little. The general premise of the series is that John "Black Jack" Geary, woken from a 100 year hibernation after barely making it to an escape pod as his ship was destroyed, takes control of the remnants of the Alliance's ambushed fleet and must now lead it home. They've made it back to Alliance space, with significant losses, but now he has to put an end of the war that's been raging between the Alliance and the Syndics for the past 100 years. All he has to do is take the refurbished fleet that just made it home back to the Syndic home system, where they were originally ambushed, and force the Syndics--who have almost no forces left--to agree to the terms of peace. He's got politicians on board to help with the negotiations . . . but what he hasn't counted on is the desperation of the Syndic leadership . . . and the ruthlessness of the unknown alien race that's ready to take advantage of the Syndic weakness at humanity's border. This book was the perfect ending to this series. After the initial elation of having the fleet arrive home in the last book, this one picks up where that elation ends with the consequences of Geary's arrival home--both politically and militaristically--and what must happen next if the war is to be stopped. That alone would have been a stellar ending to the series, but this time we get an added layer of more direct alien intervention and conflict which has been lacking in previous books. The aliens were always there, but their tactics were, until recently, subtle and manipulative. Here, we finally get direct contact with the aliens, which is both satisfying and interesting. 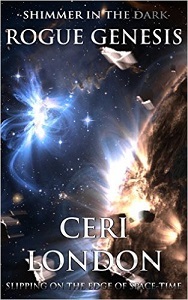 PLUS, we get a final, much needed release of relationship tension between Geary and Desjani. All of that combines into a well-balanced, fun, and completely satisfying end to this series. The characters, who have been the real driving force behind the series anyway, all receive their just and deserving attention. The main plot threads dealing with the war with the Syndics is wrapped up nicely, with realistic consequences for Geary's flight across their worlds and the confrontations with the Syndic fleets. And we get to meet, albeit briefly, the aliens who have caused them so many problems. Of course, the books have set up a continuation of the series, because the aliens were only halted, not dealt with, and so I will definitely be reading on with the Lost Fleet: Beyond the Frontier series after this. Jack Campbell is going to have to write faster; I'm catching up fast. A stellar series that I will recommend and suggest to everyone for years to come.